With their wide range of plastic bins and containers manufactured in a company owned plant BITO is able to meet any customer requirement. By adding the U-Turn stack & nest container to the EQ folding box range and the multi-purpose container series MB with conical sides, BITO now belongs to the full-range suppliers in the field of volume saving bins and boxes,” says Peter Kerth, head of the BITO product management. The new stack and nest container combines the advantages of a conventional stacking container, f.ex. the Euro-sized stacking container BITO XL, and a space saving bin such as the BITO MB multi-purpose container. With a simple rotation by 180°, the U-Turn can be stacked or nested. Nesting saves on empty container volume, thereby reducing space occupation in your warehouse and/or during transport by up to 60% and cutting freight costs considerably. The U-Turn BITOBOX is a real space saving champion that will help you optimise your logistics processes thanks to the stack and nest function and the ergonomic design. you are looking for a stackable and nestable container that combines both functions in one and the same box. you need to stock and move plastic bins and want to save on space and costs by nesting empty containers. you appreciate convenient handling and top quality bins made from food-safe polypropylene. You would like to test functionality and easy handling? Ask for a free sample container. It’s your turn! » Near-to-vertical sides with three reinforcing ribs increase storage capacity by 20% compared to stack and nest containers of similar outside dimensions. A plus of 60 mm in length (inside measurement) reduces the number of containers required for a specific product quantity. » Empty storage cuts space requirement by up to 64%, thereby cutting freight costs enormously. » The low proper weight reduces operator fatigue. Despite being lightweight, the U-Turn container has a high storage capacity of up to 50 kg depending on the container variation. The U-Turn comes in 4 standard colours for immediate product identification. Introducing a colour coding system allows to set priorities, allocate products to a product group or to a department or attribute other functions, thereby creating added value for your logistics chain. Purchases of a specific product quantity can be supplied in a custom colour or with a customised logo. Additional features such as customer specific barcode labels provide even more variety. Customers can select between 3 base options. 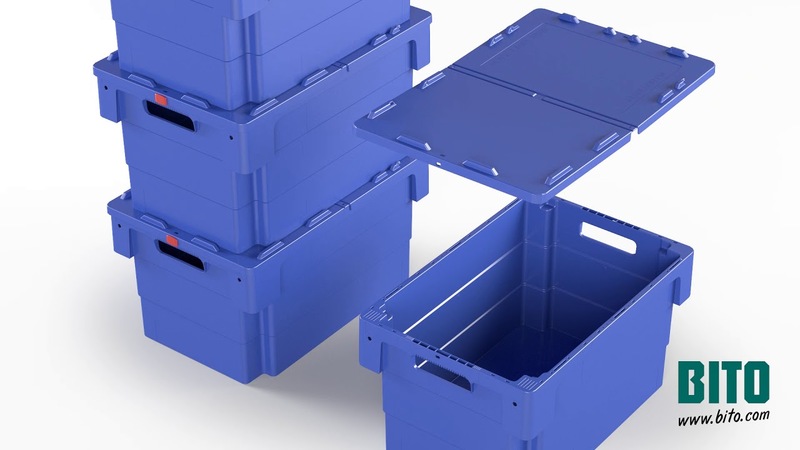 U-Turn containers with a single-layer base and a smooth surface are ideal for manual handling of loads of up to 20 kg. They are easy to clean and particularly lightweight. Stack and nest containers with a ribbed base are perfect for storing and transporting heavy-weight loads and for automated handling. The welded double base option meets the high demands of automated storage and retrieval systems and conveyor systems. The huge filling capacity combined with a low empty container volume when nested is ideal for keeping the number of containers required for a specific product quantity as low as possible while at the same time less space is occupied by empty container storage. Single layer base: smooth surface, clean, low noise travelling, for manual handling. Maximum load capacity 20 kg. Ribbed base: suited for heavy loads and/or automated handling. Maximum load capacity 35 kg. Double base: Meets highest demands for use in automated storage and on conveyor systems. Maximum load capacity 50 kg. The U-Turn container is available with grip holes or with grip pockets. Grip holes allow convenient manual container handling, while closed sides with pocket grips provide more storage volume for small parts and loose goods. The grip hole option comes with an ergonomically shaped hand rest and are available on 4 or on 2 sides. Grip pockets allow full use of the container height and are ideal for storing and moving small parts. The optionally available drop-on lid protects contents from dust and dirt and can be security-sealed to prevent unauthorised access to your goods. Of course, empty containers do not need a lid. In this case, you are not left with a cumbersome pile of lids. Simply fold the lids along the middle line and “store them away” by placing them into a container. The range of accessories also includes dollies for conveniently moving products in-house. Label holders help with fast product identification. Bag holder bars are a particularly practical accessory for the booming online food retail business and are also available for BITO U-Turn containers. With the bag handles attached to the bars, bags are held open for easy filling. Taking the bags off the bars is just as easy. The bag holder bars are mounted to the upper edge of a container. The optionally available drop-on lid can be folded along a middle line and placed into the empty box to save on freight costs. Bag holder bars keep bags open for easy filling, bag handles can be conveniently picked from the bars. Label holders allow instant product identification and can be easily inserted and removed. Recessed areas for easy peel label holders provide optimum protection of barcode labels.